Greetings Beaders & Readers! Eureka Crystal Beads is bringing you a new Blog series. We’re calling it The Beader’s Resource! It’ll be split into 5 different parts: Stringing, Wire Working, Bead Weaving, Color, and Tips & Tricks – with perhaps more down the line! Here you’ll find a compiled list of Eureka Crystal Beads resources for the topic at hand and it will be continually updated with new information (new patterns, projects, videos, tips, tricks, etc) so make sure to bookmark it and check back often! This portion on the Resource series (“Stringing”) will be great for someone new to jewelry making, someone simply new to stringing, or perhaps someone who’s looking to refine their work! We’ll include links to our most helpful YouTube videos and past blogs, patterns and projects from our website, and relevant products – and we’ll add more regularly – so let’s jump right in! >>>PROJECT<<< Here’s a VIDEO that Eureka Crystal Beads filmed on the basics of creating a bracelet strung on Soft Flex Flexible Beading Wire and using Swarovski Crystal Pearls and Swarovski Crystal bicone beads. In this video, Eureka’s Design Project Coordinator Leah Wyckoff will show you some basic techniques and design methods to create a truly finished product, including the how-to’s of finishing techniques with products like French Wire and crimp covers. You’ll also learn how to properly used Flex Wire Cutters and a Crimper Tool. >>>TECHNIQUE<<< Here’s a BLOG POST on how to use a Crimper Tool and the proper ways of “crimping” to help your projects stay together strongly! Leah goes into thorough detail on technique, crimps, and crimp covers, so if you’re feeling nervous about using your crimper tool to your nearly complete project, check this post out first, then proceed with knowledge! >>>PROJECT<<< Here’s a VIDEO that we made showing you how to use basic stringing techniques to create a stunning faceted GEMSTONE WRAP BRACELET! Learn to use quality materials, including “very fine” Soft Touch beading wire (made by Soft Flex), to achieve a high-end look without the high-end price tag! >>>PROJECT<<< Here’s a VIDEO that will expand your stringing skill-level as you learn a basic weaving technique that results in a super-sparkly Swarovski bracelet to dazzle on your wrist. A great look for your summer wardrobe or a fun evening out on the town! This is a great project to keep your hands busy while you’re multitasking, once you get the hang of it. We hope you enjoyed this blog post! 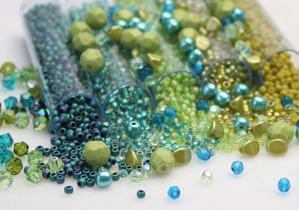 It’s the first of many in Eureka Crystal Beads‘ new Beaders Resources series, which will be continually updated with new information (new patterns, projects, videos, tips, tricks, etc.) so make sure to check back often. Drop us a comment below, or join The Beader’s Nook, a Eureka sponsored Facebook group for beaders of all skill levels. The level of community and engagement in this group is truly incredible, and you’ll get a quick variety of answers, feedback on all the work you post, and inspiration and new ideas by the minute. Plus, we have giveaways almost every week. See you there soon! Previous Post FEBRUARY BEAD CHALLENGE!